I’m using the Mutronics Mutator filter on some of the laguna drum sounds. Unlike the previously mentioned weirdo Jomox, this one is pretty much your basic standard low-pass filter with cutoff, resonance, an envelope, and an LFO. Like the Jomox, it has two filters that work independently on the left and right channels, so you can get some fun stereo effects. One thing I like is being able to set the sensitivity of the input into the envelope, unlike on the Jomox where you have to actually change the level of the input itself if you want to trigger the envelope differently. I also like how it has left and right knob controls for pretty much everything you’d want a filter to do: envelope amount/attack/decay, LFO amount/shape/speed, cutoff, resonance. It also has nice MIDI and CV control options. The only problem is that I haven’t really warmed up to the basic sound of the thing. It sounds nice enough I guess, but very clean and kind of boring. To me it just sounds like a regular old lowpass filter (albeit with various handy modulations) no matter how you set it. Which is a good thing in many respects, but is also the sort of sound that these days is easier done with a software plugin. I wish I could put the sound of some of my other filters into this one’s form (rackmount is nice) and controls (knobs for everything). Also, they’ve been discontinued and for whatever reason people really like them and recommend them constantly, so they are fetching a decent amount of money at the moment. In fact, it sells for about as much as all my other filters combined, and I have a decent (maybe even indecent) number of filters. I feel kind of lame and vaguely guilty owning something that is discontinued and rare and expensive but that I’m just not crazy about, and that somebody else would probably love to use. So, when this project is done I will likely sell it and just stick with my other cheaper and weirder filters. Here’s a demo of a Korg Electribe ER-1 making some bloops that are then run through the Mutator. First four bars just the Electribe dry, then each four bars after that with some different settings on the Mutator. Listen in stereo if possible. 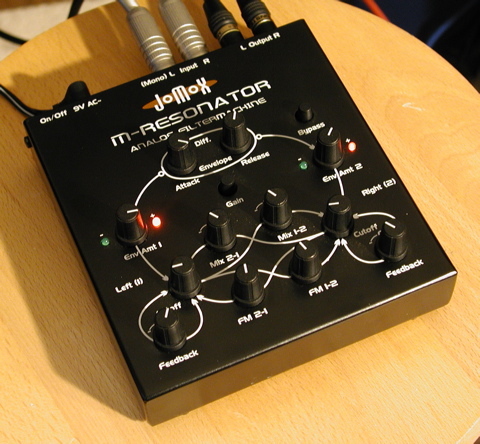 I’ve been using the Jomox M-Resonator filter on the rollover drum sounds. The drums were sounding kind of boring so I decided to go heavy on the filtering for one song and throw it on (almost) everything. The Jomox is a weird little box, it has stereo ins and outs and has a pair of standard lowpass filters with envelope followers, so in theory it’s just your standard stereo lowpass filter. But, it also has some weird feedback paths, both within each filter (the traditional resonance can go positive or negative) as well as feedback (again positive and negative) mixed between the two filters. The result very easily turns into weird distorted feedback madness that does not at all resemble the original signal. In fact on a lot of settings the thing sounds more like an extreme distortion effect than a filter effect. Which is to say, basically, the sort of thing that is fun to play with but not very useful in most musical contexts. So you have to find the sweet spots within all the various feedback paths, and since the two filters are affecting the right and left sides differently you can get some interesting stereo effects. At the same time, turning any knob in the slightest can result in howling, painful feedback, and there is only so much rational thought you can put into predicting what turning a particular knob will do… at some point the thing just kind of seems to do whatever it wants to do. For this reason, I don’t see it as a very useful live box, its just too random and crazy, but it’s a lot of fun to experiment with in the studio. A little Jomox Demo, where I go out of my way not to overdo it. 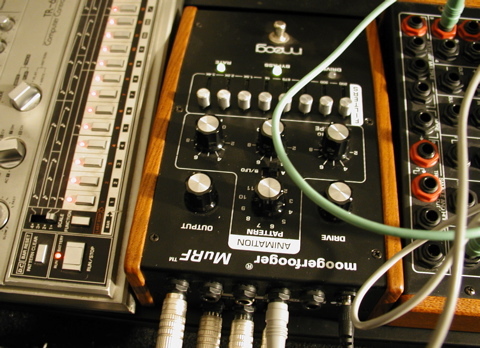 A Machinedrum pattern into the Jomox, first four bars dry, then each four bars with a slightly different M-Resonator setting. I did not include any of the really messed up ones, these mostly sound like a normal filter, with some interesting stereo bits. Of course you can also just use it to make bizarre howling feedback noises, with or without an input signal. This isn’t really my thing musically, so I mostly avoid those bits, but as I mentioned before it’s hard not to stumble upon them just by turning a knob a little too much. Here’s a Youtube video made by somebody that shows its weirder side. The last set of three songs is almost done, they have one more cycle of listen’n'revise to go through and then I’ll put them up and move on to the full mix. 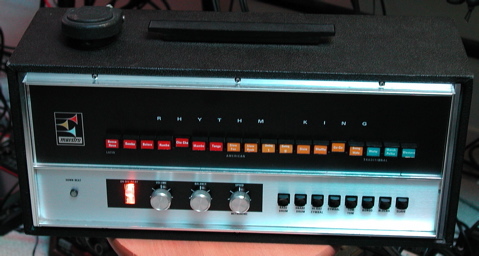 The Maestro Rhythm King MRK-2, an early analog drum machine from the 70s that Sly Stone called the “funk box”. He used it all over his classic album “There’s a Riot Goin’ On”. Click on the photo for a larger picture. Here’s a free Maestro Sample Set you can use. This article gives some more info on Sly and the Maestro, as well as other early drum machines. And an article about what happened to Sly and what he is up to these days. There is at least one comment out there that does say specifically he used the MRK-2, and most of the articles that talk about him and the Maestro use a picture of the MRK-2. It was, however, the most popular of all the models so they may just be putting up the picture that was easiest to find. Note the MRK-2 came out around 1970, right around when he got his new drum machine and was recording “Riot”. I am not sure when the MK IV came out… if you have info on that let me know! that they could trigger it either by the drumpads used by Wolfgang and Karl or by one of their customized Synthanorma sequencers. The drums on TEE were done this way. I recently bought a Roland CR-78. It’s an old drum machine from the 80’s, the first one from Roland that let you program and save your own patterns instead of just using presets. We used samples of it on both our first album and the last EP, it has some great drum sounds that we keep falling back on. I’ve wanted one for a long time, and have been patiently waiting to find one in nice condition at a decent price. Unfortunately for me, like a lot of other vintage analog gear, the prices have just continued to go up. Finally, I said screw it and bought one anyway. Now that I have the real thing, I’ve found it’s pretty fun to play with, cool and quirky looking, and sounds great. The biggest problem is the programmer device that you need to program it is pretty rare and ends up being almost as expensive as the currently rather overpriced CR-78 itself. The programmer also seems kind of tedious to use, it’s a manual note by note step editor rather than the x0x type sequencer that Roland developed soon afterwards for the TR-606 and TR-808, so you have to pre-plan the pattern in your head and then enter things into it in sequential order: hit, rest, rest, rest, hit, rest, hit, etc. Anyway, using Google and reading up about programming the CR-78 on various sites across the net, I found there was no good solid explanation for how to program the thing sans programmer. One person mentioned they used a pedal in the programmer slot to record notes in real time; I’m a techno geek who sequences everything, so that didn’t really appeal to me except as a last resort. Another person mentioned they used their computer’s sequencer to send out audio clicks to the CR-78 and program it. That was getting warmer, but still wasn’t exactly what I wanted. 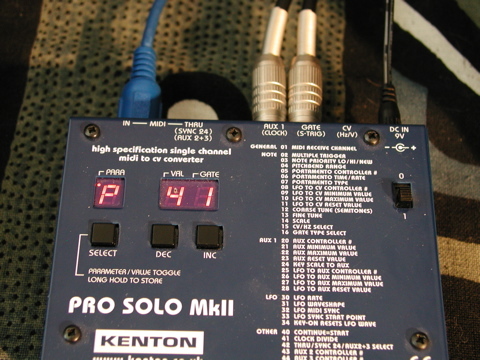 I had already used my Kenton Pro Solo mk2 to sync up the CR-78 with MIDI clock. 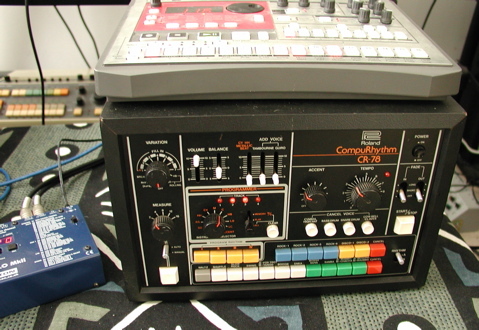 Note that the CR-78 uses a 1/4″ clock input and a non-standard 12cpqn clock, unlike the DIN SYNC used for the TR-606, TR-808 and other drum machines, which is why I had to use the Kenton. I also already had an Electribe ER-1, which is a cool little drum machine with a fantastic x0x style sequencer interface that sends MIDI. My thinking was: if a pedal could program the CR-78 in real time, surely a gate signal from the Kenton could do the same, and maybe I could sync everything up and then use the sequencer of the Electribe to clock and trigger the Kenton which would in turn clock and trigger the CR-78, resulting in a nice x0x interface for the CR-78. After some experimentation, I got it all to work. As a bonus, I found I can play an extra realtime part on the CR-78 using the Electribe sequencer, giving me a total of five simultaneous sequenced CR-78 parts (four triggered internally by the CR-78, one externally by the Electribe). Also, the CR-78 only has enough internal memory to save four different two bar patterns, but I found that by saving the patterns internally in the Electribe and then dumping/programming them into the CR-78 as needed I now have access to a lot more stored patterns. Hook the Electribe MIDI OUT to the Kenton MIDI IN with a MIDI cable. 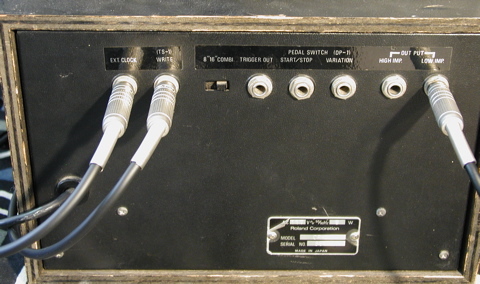 Hook the Kenton AUX 1 (CLOCK) to the CR-78 EXT CLOCK with a 1/8″ to 1/4″ patch cable. Set Parameter 1 of the Kenton to 1. This sets MIDI channel to 1. Set Parameter 20 of the Kenton to CL. This sets the AUX 1 port to output clock. Set Parameter 41 of the Kenton to 2. This sets the clock to 12 cpqn, which is what the CR-78 uses. Set the MIDI channel of the Electribe to 1. Press MIDI pad, choose top parameter, set to 1. Set the MIDI filter of the Electribe to send everything. Press MIDI pad, choose fourth down parameter, set to three ovals. Set the clock of the Electribe to internal. Press Global pad, choose fourth parameter down, set to int. Now, make a completely blank pattern in the Electribe with all steps for all instruments empty. Set the pattern length to 1 and use a pattern scale of 16th notes. Read the Electribe manual if you don’t know how to do this. Select a preset rhythm pattern such as DISCO-1 on the CR-78. Press START on the CR-78, and then press play on the Electribe. 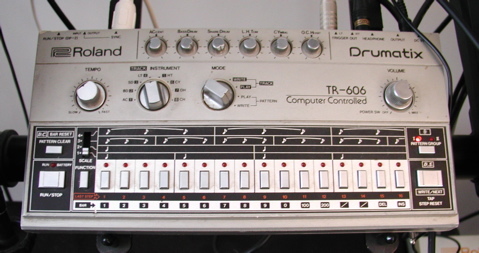 The CR-78 should start playing the preset rhythm sequence in time with the ER-1. Adjust the tempo on the Electribe and make sure the CR-78 follows. 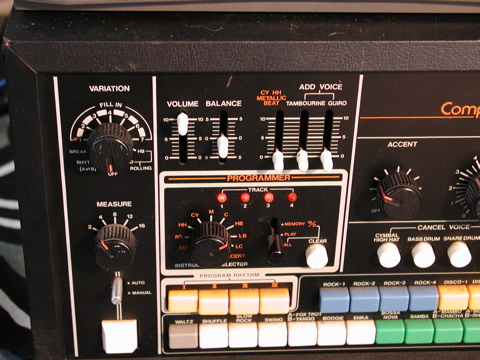 Press START/STOP on the CR-78 to stop its sequencer. Press stop on the Electribe sequencer. Press START/STOP again on the CR-78. It won’t start yet, but will reset the sequencer to the beginning of the pattern. Press play again on the Electribe. They should now be playing in sync. 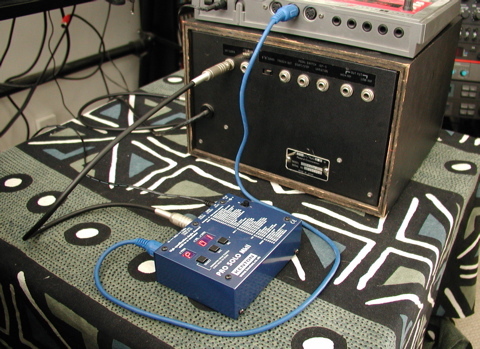 Hook the Kenton GATE (S-TRIG) to the CR-78 (TS-1) WRITE with a 1/8″ to 1/4″ patch cable. Get the Electribe and CR-78 synced up and running as described in Part 1. 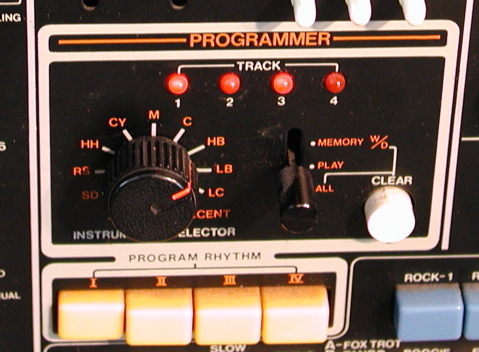 Press one of the PROGRAM RHYTHMs (I-IV) buttons on the CR-78. Make sure none of the preset rhythms are still playing, only the existing CR-78 programmed sequence (if its been programmed) should be playing. Clear the CR-78 sequence by flipping the PROGRAMMER switch down to ALL, then press the CLEAR button, then set the PROGRAMMER switch back to PLAY mode. You have erased that memory slot, so the CR-78 should no longer be playing any sounds. Select the CR-78 drum sound you want to trigger by using the PROGRAMMER INSTRUMENT SELECTOR knob. Next, repeatedly hit one of the instrument pads on the Electribe, Percussion Synthesizer 1 is good. You should hear it trigger the selected CR-78 sound. The Electribe is sending a MIDI note to the Kenton each time you press the button, the Kenton then sends a gate signal for that note to the CR-78 which triggers the drum sound. Program a simple one bar pattern on the Electribe’s x0x sequencer using that single Electribe part. You should hear the notes you set on the Electribe sequencer trigger in time on the CR-78 as the pattern is played. You should already have an Electribe sequence running and triggering the CR-78, and a CR-78 user pattern cleared and ready to program from Part 2. Flip the PROGRAMMER switch up from PLAY mode to MEMORY mode. All four PROGRAMMER LEDs should briefly flash and the CR-78 will make a little sound. You should hear the Electribe triggering the CR-78 sequence that you are programming. Let the programmed pattern run at least two bars, until you see the first CR-78 PROGRAMMER LED for TRACK 1 start flashing in time with the sequence you have programmed. Now flip the PROGRAMMER switch back to PLAY. Manually clear the drum pattern on the Electribe sequencer by pressing the pads until none of them are lit, but keep the sequencer running. You should still hear the sequence you just programmed playing on the CR-78 sequencer even though the Electribe is no longer triggering it. Select the new CR-78 sound with the INSTRUMENT SELECTOR knob. 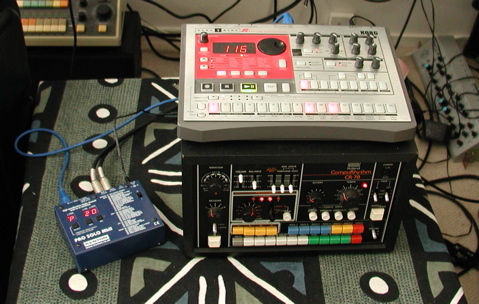 Program a drum sequence into the Electribe sequencer by pressing the pads as it is running, which should trigger the CR-78 sound in time with the pattern. Flip the CR-78 PROGRAMMER switch up from PLAY to MEMORY, and let the pattern run for a couple bars. Wait for the CR-78 PROGRAMMER LED for TRACK 2-4 (depending on which instrument track is being programmed) to start flashing in time with the sequence being programmed, then flip the CR-78 PROGRAMMER switch back to PLAY. Manually clear the drum sequence in the Electribe, and then listen to your sequence continue to be played by the CR-78 sequencer along with the other previously programmed instrument tracks for that rhythm sequence. Once you have programmed all four instrument tracks, keep the CR-78 PROGRAMMER switch in PLAY position, select a new fifth CR-78 instrument using the INSTRUMENT SELECTOR, and you can now also play a fifth track using the Electribe’s sequencer. The accent track is a good choice, or you can use the Electribe’s sequencer to program a longer and more complicated percussion sequence, or whatever you want. Note you can also play along like this when preset rhythms are activated. The CR-78 sequencer can save two bars worth of sequences for each track. Using the above method, we were basically filling both bars twice with the same repeated single bar Electribe sequence. To program both bars, just set the Electribe pattern loop length to 2, and program a two bar sequence on it like you would normally, and that pattern will get saved in the CR-78 sequencer. See the Electribe manual if you don’t know how to do this. Also, you can set the Electribe pattern scale to use 1/32 notes instead of 1/16 notes… again, just set it up like you would if you wanted to program the Electribe to do the same thing, and program the CR-78 as above. This will let you program some nice quick hihat or snare rushes. Using this scale, a two bar sequence will fill all four 16 step sections of an Electribe sequence set to pattern length 4, which works out nicely. Edit: I received an e-mail from someone with a MIDI-retrofitted CR-78 who tried this and had his CR-78 freak out. So if you are using a CR-78 with a MIDI kit added on, be careful about using this setup. “The synchronisation worked perfectly for about an hour when all of a sudden the CR78 threw a fit and poured out multiple random rhythms at vastly fluctuating tempos whilst the 4 red Programmer Track lights went a little crazy (nb: the 4 user programmes are empty and not in use). I disconnected the Kenton and tried the CR78 alone… same thing again.” I don’t know any reason for this to happen, and it hasn’t happened with mine after a lot of use, but again use caution if you are using modified gear. Listen to a demo of the ER-1 samples in action, first dry, then through Izotope Trash, then through Trash + Ohmboys Ohmygod + SoundToys Echoboy. The Roland TR-909 always reminds me of my first Atari computer. I think it’s probably the grey color scheme and old school computer keyboard type buttons. Its kick, snare and hat sounds have been beaten into the ground, dragged back up to their feet, and then beaten down again several times over. They still sound good. I tried to create some not-so-normal 909 sounds for “lurp”, I’m not sure I really succeeded, and some of the sounds I’m not all that happy with. The sounds I ended up using in the demo were basically the ones that most sounded like a 909, which basically says I failed in my attempts to get something new and good from it. Oh well. The other samples sound sort of industrial, they will hopefully be usable if I play with them a bit more in the sampler but they ended up sounding a little too harsh for the demo. To process the samples I first gave them a heavy dose of Culture Vulture distortion, and then used the Sonalksis EQ, compressor, and gate plugins with a touch of Audio Damage Reverence reverb. Listen to a quick demo of some of the sampled TR-909 sounds, first dry, then through the FabFilter Volcano filter and Audio Damage Dubstation delay plugins, then the same thing again with a synth sound added. Here are the samples, I used a lot of distortion so some of them sound sort of industrial. 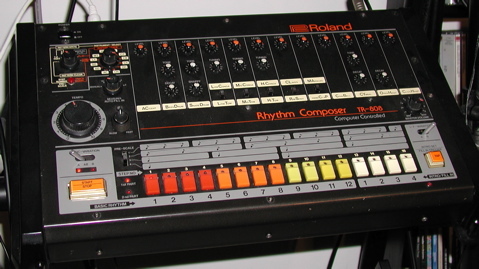 I love the Roland TR-808, it’s got my favorite drum sounds ever and it’s just fun to use. For “puppy” I wanted some lighter, crisper type drum sounds so I tuned and EQed the 808 accordingly. Listen to a quick and simple demo of some TR-808 samples that I made for “puppy”, first dry, then through the Waldorf D-Pole plugin, then through the SoundToys EchoBoy plugin. Here are the samples themselves. 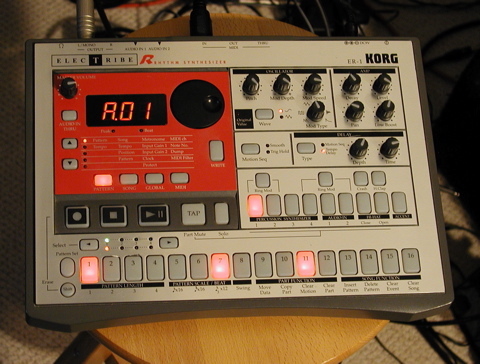 I recently bought a Korg KPR-77 drum machine since it’s cheap, analog, and was rumored to be similar to the TR-606. The sequencer is a bit more fiddly than the 606’s easy and intuitive x0x-style programmer, and the sounds aren’t nearly as good… but it’s a fun little beatbox with some character. Like the 606, there is no control over the individual sounds other than volume, and I had to do a fair amount of processing to get sounds I was only marginally happy with. Overall, my thinking is that the KPR-77 will be a good supplemental analog blip machine (after being sent through some processors) to layer some additional sounds on top of the 808 and 909, but it probably won’t be used as the foundation of any drum tracks. But who knows, maybe something will call for its particular sound. This is a short and simple demo using the samples that were created for “lemon”: four bars of just the straight KPR samples, then four bars through the Trash plugin, then four bars through Trash + FilterFreak + Dubstation plugins. Here is a set of six samples from the Korg KPR-77, going through the Culture Vulture for light distortion, and then processed with UAD EQ/compression/reverb and Sonalksis gate plugins. The TR-606 is the more affordable little brother of the better known TR-808 (hip hop and electro) and TR-909 (house and trance) drum machines. The sounds are generated with analog circuits, not with samples, but you have no real control over the sound parameters other than volume. There are some custom kits available to modify these boxes to have more control over the sounds, but mine is currently not modded. The 606 has the intuitive step sequencer the x0x drum machines are known for, can be synced up with other machines using DIN-SYNC, and has trigger outs that can be used to sequence gate triggers on other boxes (such as the Moog MURF effects processor). It’s got a nice electro 80’s drum machine sound to it that improves considerably with some distortion, EQing and compression.